All the strength of our basic awning with the added features of a pergola. Add this feature to any of our awnings to give your outdoor living area a different look. All our parts are cedar embossed coated aluminum to give it that wood grained look. Since its aluminum, you can spend all your time enjoying your patio rather than working on it. 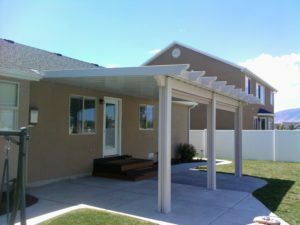 We don’t skip any corners when installing from our own unique way of attaching the front rafter tails, to providing a custom galvanized beam under every awning. we have many styles and colors to match your home and budget.